Moto G7 Series consists of 4 models that includes Moto G7, Moto G7 Play, Moto G7 Plus and Moto G7 Power. 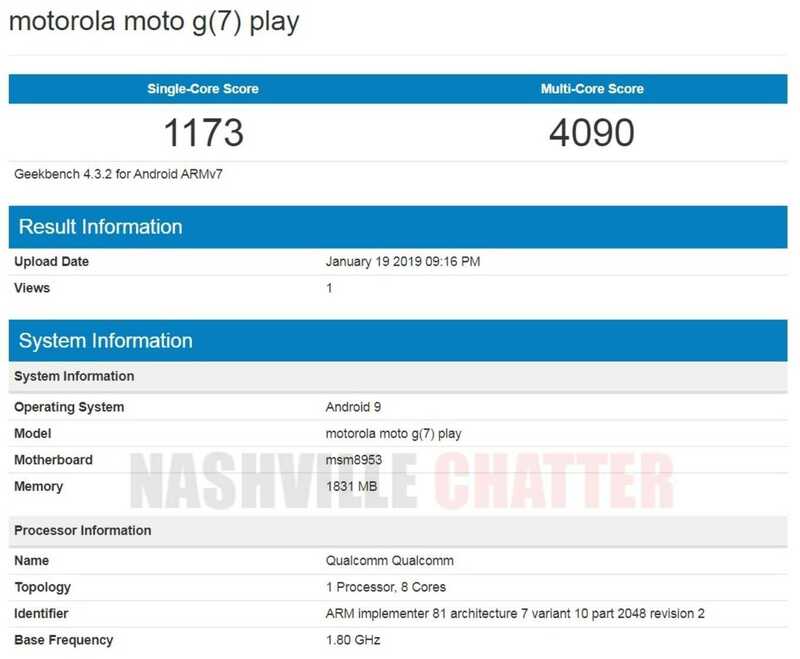 Moto G7 Play is expected to be the one with the lowest specs among the four models in the G7 series and it has appeared in Geekbench today with low end specs. The listing reveals that G7 Play would have just 2 GB RAM and will be powered by the age old Snapdragon 625 SoC. Despite the low specs, it comes with Android 9 out of the box. There could be a 3GB variant for this model but the internal storage would just be 16 GB and 32 GB. The phone scores just 1173 points in single core and 4090 points in multi core score. Moto G7 had recently made an appearance in Geekbench a couple of days ago and it scored 1260 in single core and 4759 in multi core performance. While the phone had 3 GB RAM, the processor was the same Snapdragon 625. While this listing could probably be referring to Moto G7 Play and not the actual G7; however, if that turns out to be true, it would really disappoint the fans and we expect Moto G7 to have atleast Snapdragon 660 SoC powering it. We have already seen the appearance of Moto G7 Play with model number variants XT1952-1 and XT1952-2 in the FCC website, which revealed quite a few details including both internal and external images of the upcoming phone along with the user manual. The dimensions of the phone were found to be 146 mm x 71 mm along the sides and 156 mm on the diagonal which amounts to 6.14 inch screen size. The display size would certainly be smaller than the overall screen size and it could be close to 6 inches. The battery would be a moderate 3000 mAh. Motorola is about to unveil these phones in Brazil next month, however the launch yet is yet to be confirmed. It could be held as a separate event before the MWC 2019 starts in Barcelona on February 25. Next Next post: Samsung Galaxy S10+ Exynos 9820 Variant Appears on Geekbench with Disappointing Scores!